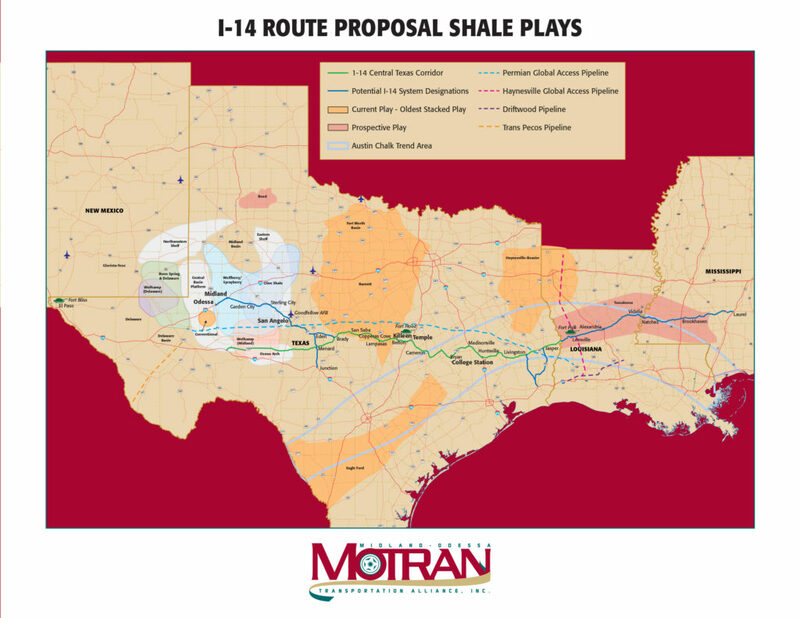 In 2016, MOTRAN joined with the Gulf Coast Strategic Highway Coalition to begin work on the task of re-designating the western segment of I-14 from its current path of Brady to I-10 along US 190, to San Angelo and Midland-Odessa via US 87 and SH 158. “The Midland-Odessa route via San Angelo will dramatically increase the population served, freight usage, and will more than triple the initial traffic as opposed to the US 190 route, so we think the change just makes good sense,” added past MOTRAN Chairman Trey Crutcher. MOTRAN and the Gulf Coast Strategic Highway Coalition have had numerous discussions and both worked with congressional and state leaders to draft language and build support for the effort. In January of 2018, Congressman Mike Conaway filed HR 4823, titled “Connecting the Rest to the West” which serves as the legislative vehicle for these changes. The route is also being mirrored by the development of the Permian Global Access Pipeline project. The LNG pipeline would draw from the WAHA hub, as well as a line coming from Jal, New Mexico, and terminate at the Driftwood Hub on the southwestern Louisiana coast. The Driftwood hub would also be fed by another pipeline originating in the Haynesville-Bossier play, as well as a line originating south of Alexandria, Louisiana.